How much will you need to save to help your child get a college education? That is the question my College Savings Calculator can help answer. College can be very expensive, so a parent would be wise to set up a college savings plan as early as possible. The calculator can help you figure out how much to save each year, and you can include costs for K-12 and High School as well as college. If your college plan includes a study abroad, mission, or some other major cost, you can include that, too. I've been meaning to make something like this for my own use for quite a while, and now I know why I didn't. Anyway, I hope you find the calculator useful at least. Create a college savings plan. Include costs for grades K-12, High School, College, and other major events. Add extra deposits within the yearly savings schedule. Make a copy of the worksheet for each child. Automatically solve for the monthly deposit amount or choose a different deposit frequency. Important: The default inputs in the college savings spreadsheet are simply for illustration. You will need to change the values to fit your needs. 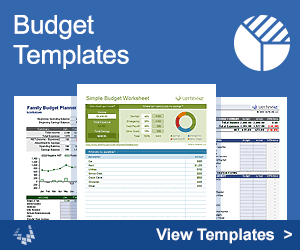 You may also want to check out the free College Budget Template. "No Installation, No Macros - Just a simple spreadsheet - An original creation by Dr. Jon Wittwer of Vertex42.com"
The investment year is assumed to start at the beginning of the school year (in August for example). Annual deposits are made at the end of the year and school costs are withdrawn at the beginning of the year. The Age and School Year columns are for convenience in identifying when the child will be in what grade level. The calculator makes the assumption that the child enters kindergarten at age 5. If you need to, you can edit the list of grades in the formula for the School Year column to customize the grades associated with your child's age. This calculator lets you create a general educational savings plan because you can include costs for more than just college. High-School can be pretty expensive (club fees, band instruments, music lessons, travel, etc.) and if your child attends a private school that can really eat at your budget as well. All the costs for the year are assumed to be withdrawn at the beginning of the school year. That is probably not how it will really happen, but unless you are somehow getting a crazy amazing interest rate, the exact timing of the withdrawals won't make much difference. The calculator will err on the conservative side, because if you left your funds in the account longer, you'd make more interest than the calculator predicted. If you're college savings plan is anything like mine, you'll probably find that interest earned is very small compared to the amount you will have invested, unless you are funding the account at a level to put your kid through Harvard. If you are planning for a mission or study abroad, you can include the cost in the years C-2 and C-3 or whatever the case may be. I'm not sure whether it will remain accurate, but the current cost for an LDS mission is listed on wikipedia. The college savings plan calculator is set up by default to calculate the monthly deposit amount based on what you have entered as the Initial Savings, Annual Deposits, Costs, and any Extra Annual Deposits made within the schedule. NET Value: If this value is Zero then you will just break-even, or in other words, you will have saved just enough to cover all the costs. If you want to solve for an input other than the deposit amount, you can manually enter the deposit amount and then use Goal Seek or Solver to set NET to zero while changing one of the other inputs (like Initial Savings, Annual Deposit, or the Interest Rate). Years to Make Deposits: The calculation to solve for the deposit amount will only work if the years to make deposits is less than or equal to the year before the last payment. 401k Savings Calculator by Vertex42.com - For 401k calculations, where you have an employer match, increasing salary, etc. Savings Calculator by Vertex42.com - The college savings calculator was based on this general savings calculator. 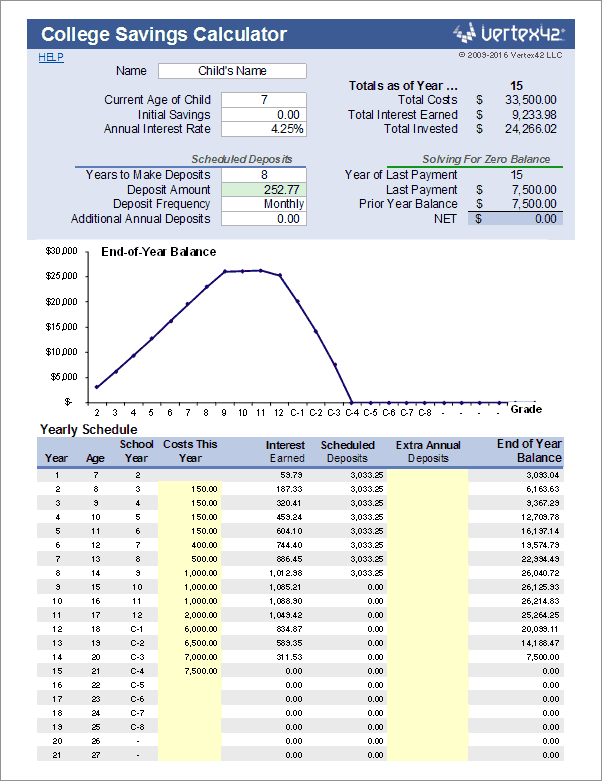 NPV Calculator - by Vertex42.com - Creating this Net Present Value Calculator and writing the article on discount factors is what gave me the idea for how to solve for the deposit amount in the college savings calculator. Disclaimer: This spreadsheet and the content on this page is for illustrative and educational purposes only. The results are only estimates. The information and results are not intended as financial advice.